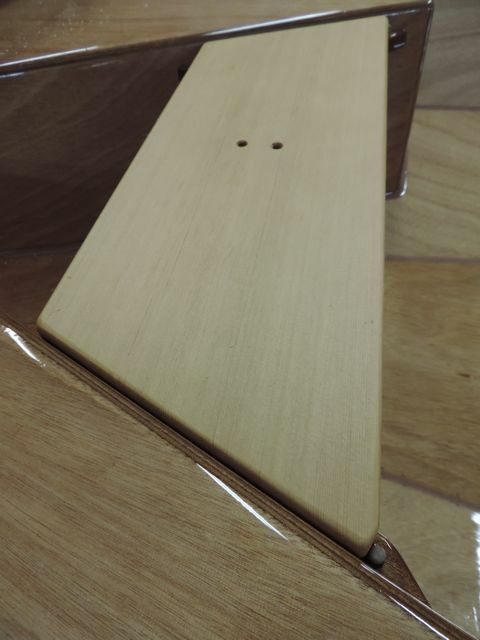 Does your rudder not stay down? ...Your back seat slip off? ...Your knobs tight and your leather pads loose? Maybe we can help. We have used our PT 11’s hard enough and long enough to have had some issues and it seems like it’s time for a maintenance discussion. Also, there were manual updates that earlier builders didn’t get to see that we will show here. We would like to hear from you as well. If you have had issues or failures with your boat, we want to know. Sometimes really bad things happen to boats, such a backing into one with a truck, (which we did) and sometimes the repairs are actually quite easy, so let us know if something like this happens to you. Does your rudder kick up when you don’t want it to? If the rudder rotates back just a little bit then the pressure on the tiller increases dramatically. We’ll talk about how to fix it below. How many of you have used the self-steering feature on the 11? The hiking stick is of a length that if the tip is placed in the aft corner (as shown below), the boat can be steered by shifting weight side to side. 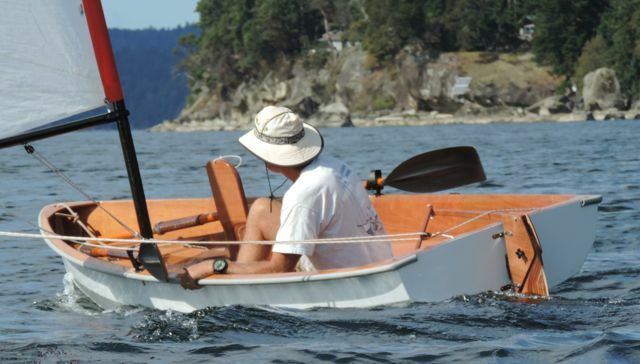 This only works if there is pressure on the tiller (usually when going upwind or reaching), but one can go for hours in steady breeze without steering (even without shifting weight) or this feature can just be used when needing two hands for something. The traveler line can be short to make it less in the way when not sailing. We drilled holes about 14” apart (7” either side of center), ran the traveler line through those holes and used stopper knots underneath. The holes should be about 5/16” diameter and be sealed carefully with a couple of coats of epoxy. The traveler line can be 3/16” or 1/4” diameter. The hiking stick can still pass through if the rudder is fitted to the boat with the stick facing aft. 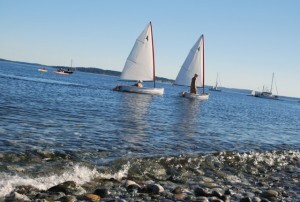 As we indicated, having the rudder not stay down all the way can mess up a good sail. 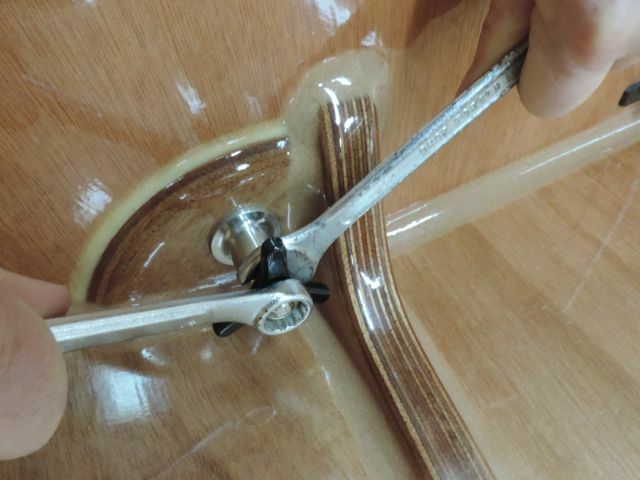 Usually this is caused by corrosion forming in the brass insert inside the plastic knob, reducing the force that can be applied with the knob. Cleaning out the threads and applying a bit of grease should solve the problem, if not, try applying strips of tape to the rudder as shown. We’re not sure which type of tape is best. Electrical tape smears, but sure does make the rudder stay down. Plain masking tape or plastic tape may be better. If you have one of our boats, you know that the hiking stick is attached with a piece of bungee. This works amazingly well, but the bungee should be replaced every couple of years, especially if you like to scull with your rudder. We just found a source for Dyneema (Spectra) covered bungee and will now be providing this with our kits. 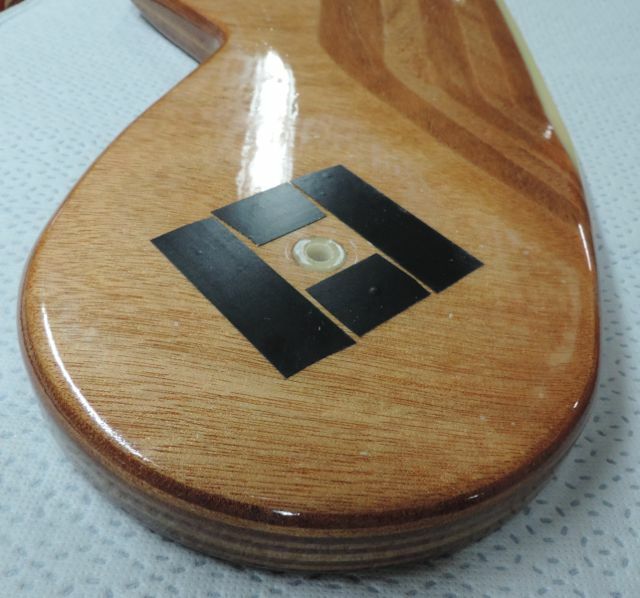 If you would like a short piece for your hiking stick, let us know. 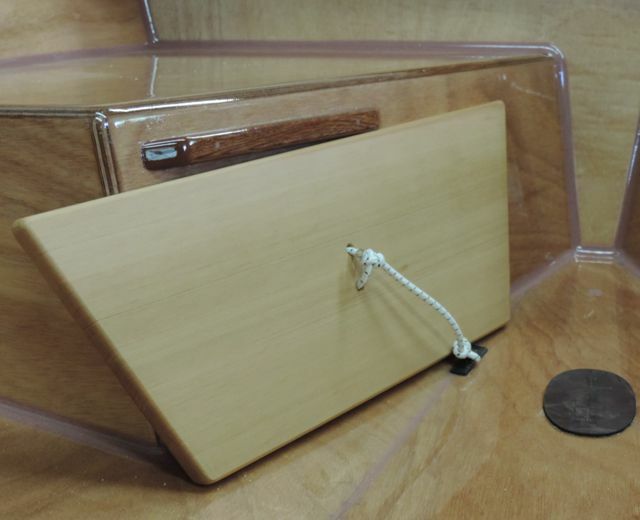 While we are on the subject of rudders, the rudder will only fit into the foils cases that we sell if the knob is on the port side as shown in the photos. As described in the manual, the port side is good if you are right handed, but we never realized that putting the knob on the other side would restrict the fit in the case. If you are set up left handed, we have one left handed case in stock. The rudder should be folded as shown to fit into the foils case. The forward leather pads had to be replaced on our older boat. It seems that there is a lot of sideways force applied to these pads when the boat is nested and tied down tightly or if people sit on the boat when nested. 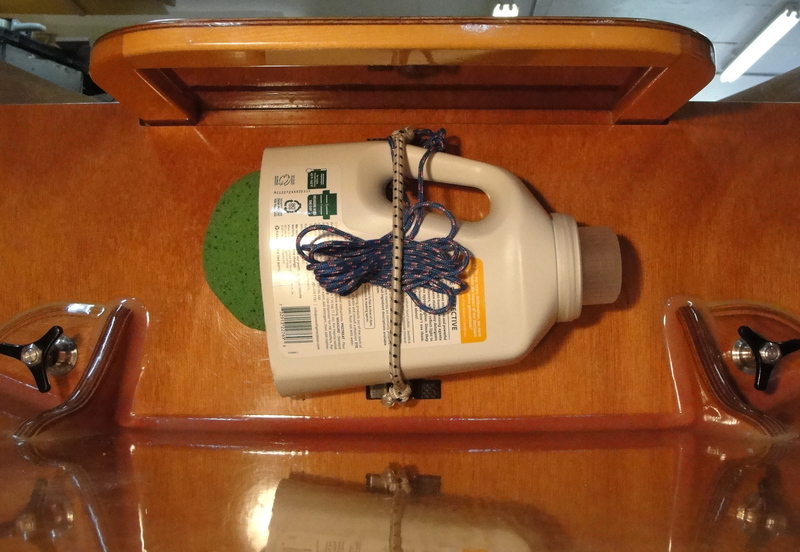 The adhesion of the contact cement to the boat can be improved by sanding the epoxy with coarser sandpaper (100 grit, or so), instead of just using the 3-M scrubbie. This is challenging, of course in such a tiny, taped-off area, but still easier than replacing one “in the field”. 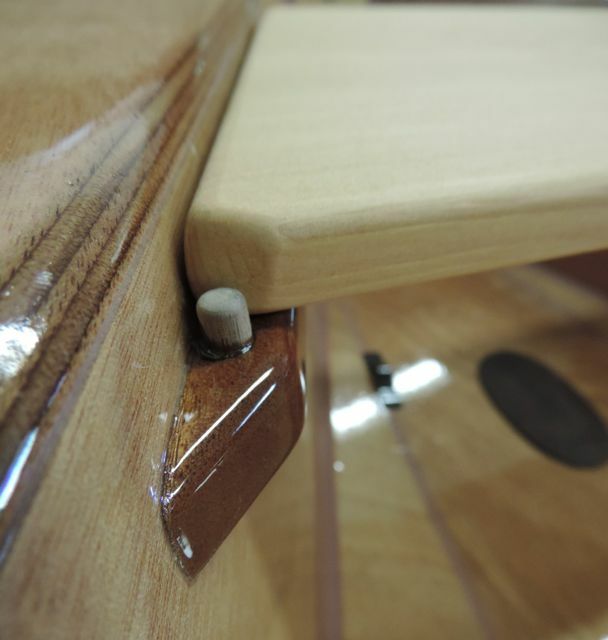 The manual now shows glued-in hardwood dowel pins keeping the back seat from sliding forward. If your seat slides off and you want to do something about it, we will e-mail that part of the manual to you and can send the pins as well. Not included in older manuals is trimming the width of the seat to allow wedging it between the bungee eye strap and the cleat that supports the seat. This can be handy to keep the seat out of the way when nesting. 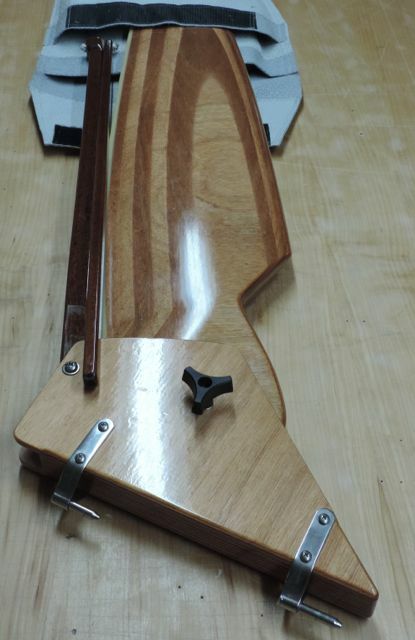 It is not a very positive way to hold the seat, but it works with no extra parts or steps. 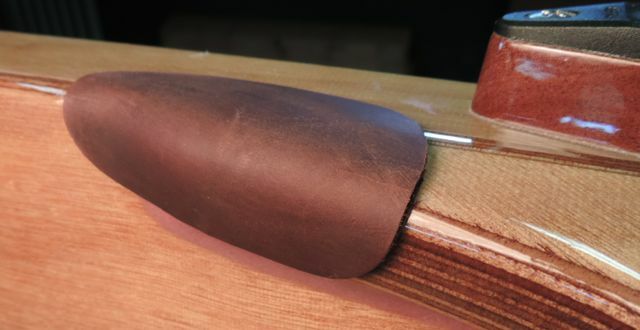 The width of the seat should be trimmed a little bit at a time with a table saw or block plane until it just wedges in place. Also missing from older manuals is the dagger board hold down strap. It is a loop of line that just fits around the aft turn dog base as shown. Notice the tether on the trunk cap? it is glued into a hole drilled in the cap but tied to a custom washer that we now include in the kit. If you didn’t get one, let us know. The connective hardware now uses 316 stainless C-clips that fit into notches in the pins to make the pins captive. Older boats have O-rings that serve the same purpose, but the O-rings & surrounding areas require cleaning and greasing to keep them from getting stiff and hard to use. If you want to change O-rings and didn’t get extras with your kit, let us know and we will mail you some. Remember to use just a small amount of grease after cleaning all the parts well. The pins can be removed with two 9/16” (14mm may fit) box wrenches as shown. The nuts, knobs, and washers are removed before pushing the pins out forward. These bailer photos have appeared on an earlier blog, but a good bailer is an absolute necessity and showing this again seems important. This half-gallon laundry product bottle has had it’s bottom cut off and has a long tether attached to one of the eye straps placed above and below the bailer. 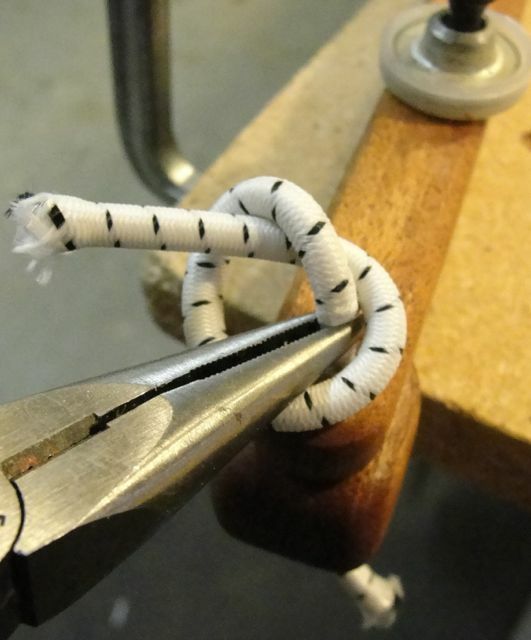 We used carbon fiber glue-on eye straps, for tying the bungee to, but small stainless eye straps would work fine using 3/8” long screws installed with epoxy. 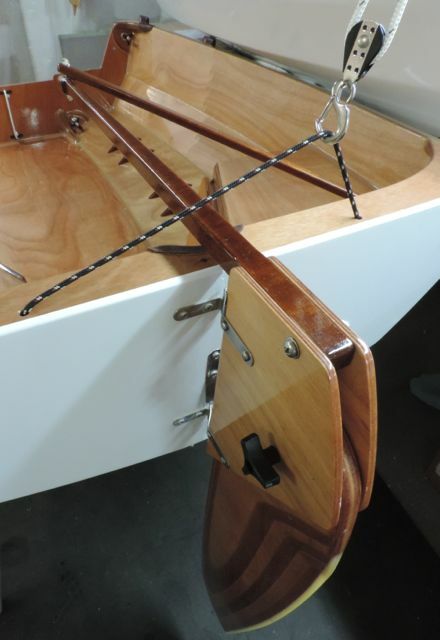 Placing the bailer in the location shown keeps it out of the way and also allows nesting the boat without removing the bailer, as long as the bailer is not too big. If you capsize, sweeping the water out with your arm or sloshing out the water before getting back in gets much of the water out in a hurry. Have you seen our capsize video? 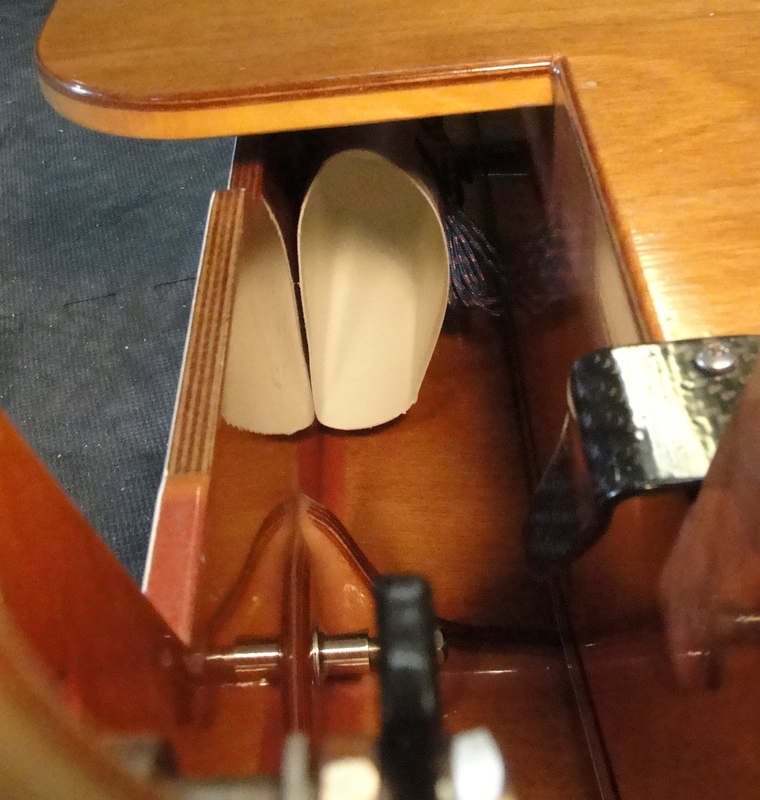 Oars need collars (or stops) to keep the oarlocks from sliding off the oars. Hopefully your oars came with collars that work with the large Gaco oarlocks and are adjustable. The collars should be adjusted to fit the boat, so that when rowing the oar handles almost touch each other on the centerline of the boat. 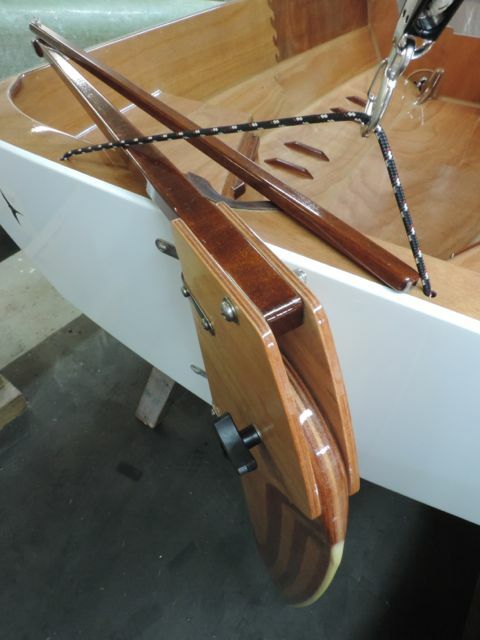 The collars should be adjusted to fit the forward oarlocks because they are closer together. Measuring from the outboard edge of the collars to the inboard tip of the oar handle, 22 1/4” should work fine. The collars shown were made from contact cementing a long length of 3/4” webbing around (and around) the oar. 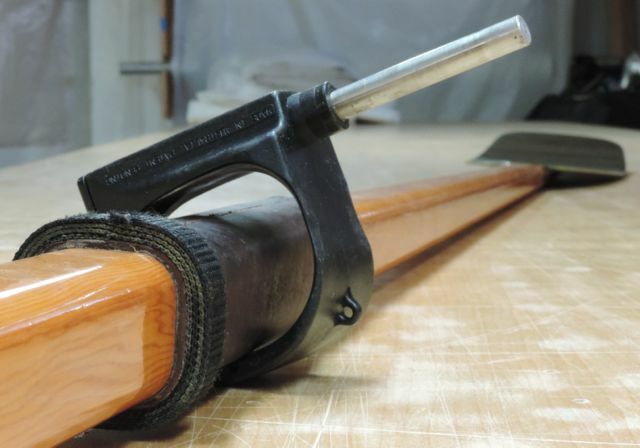 This is not the easiest thing to do and hopefully you have oars with collars that work well. The diameter of the collars shown is not large enough, as the collars can get wedged in the oarlock, restricting rotation. If your PT 11 or Spear is damaged, even if it happened in an embarrassing way (such as backing a truck into it), we want to hear about it. Take careful photos and send them to us. sometimes big repairs can be quite easy to do. One repair that would not be easy to fix is what could happen if your mast was not seated all the way down in the socket and you went sailing. The socket itself is not very strong, it’s the upper and lower mast partners that spread the considerable mast loads out into the boat. If the mast wasn’t all the way down, the bottom end of the mast could break the socket and a very ugly hole in the deck would result. A mast hold-down is not very convenient, but could be just an eye strap mounted to the deck just aft of the socket. 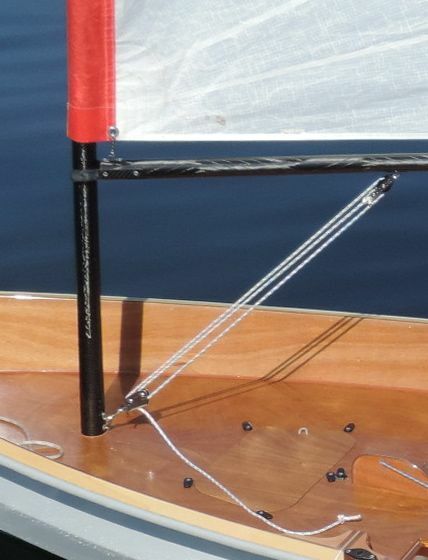 A bungee or lashing to the boom vang eye strap would hold the mast down. 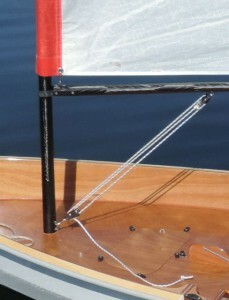 A wrap of colored tape on the mast to show when it is fully seated is another idea. Remember to check that the mast is seated after a capsize. Speaking of the boom vang, don’t over do it. 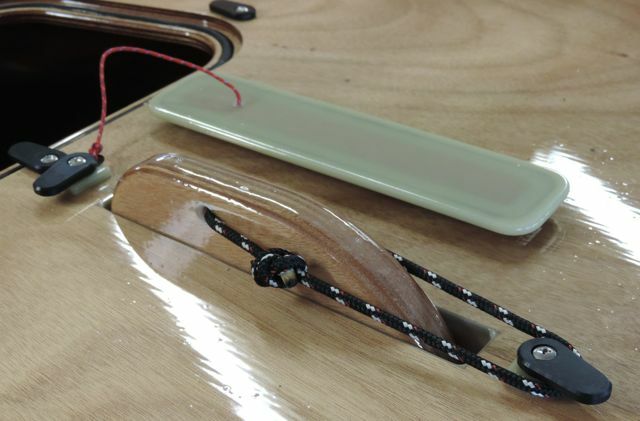 The sail is most powerful if it twists a bit, and the boom could be broken if you used way too much tension, so go easy on the vang. 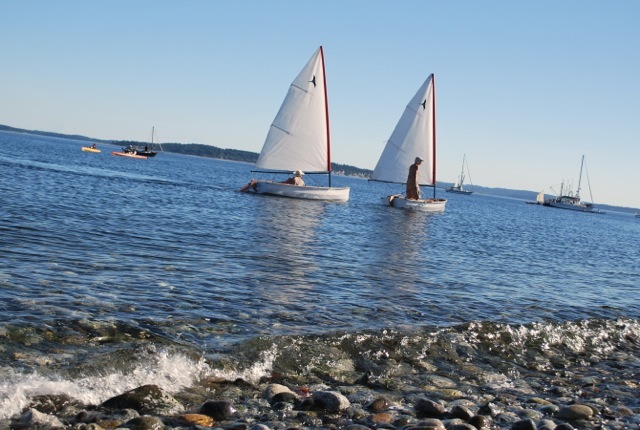 Also, remember that dinghy sailing takes a lot of skill and should be approached cautiously. Going for your first sail on a gusty day is not a good idea, even if you sailed dinghies as a kid. Ease into it by starting in light and steady wind. build your skills in stages. If you are serious about it, do a capsize and self-rescue test, but do it with help nearby and don’t forget the bailer. PDF version of this guide HERE.